Not sure where that file you just downloaded to your Mac actually came from? There’s a quick way to check in macOS. When you’re installing software on your Mac, it’s a good idea to make sure you know where the file came from, because some sites bundle malware with downloads. But it’s also just plain interesting to see where various sites are directing you when you download something. Checking this out isn’t difficult. Right-click the downloaded in Finder, and then click the “Get Info” command. You can also select the file and then press Command+I. In the Info window, expand the More Info section. You should see two URLs: the exact one for the download, and also the site you where clicked the link. In the example below, we downloaded Firefox from the Mozilla web site, and the file came from the Mozilla server. 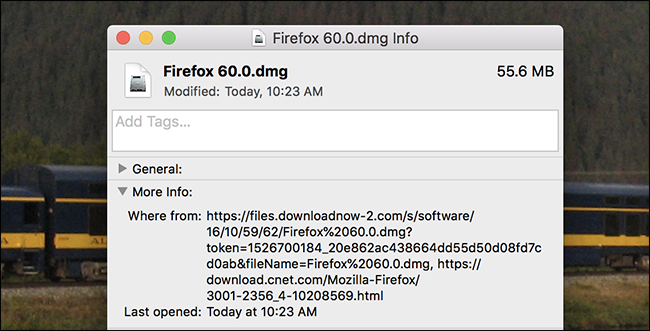 We also downloaded Firefox from the MacUpdate site, and discovered that their link pointed to the exact same download link as Mozilla. CNET, on the other hand, hosts the file themselves, as you can see below. This CNET download was also out-of-date when we downloaded it, which is as good a reason as any to download software directly from the official home page. If you can’t remember where you downloaded something from, however, this quick tip is useful. Thanks to Melissa Holt at Mac Observer for pointing it out to us.